NORTH ATTLEBORO, Mass. 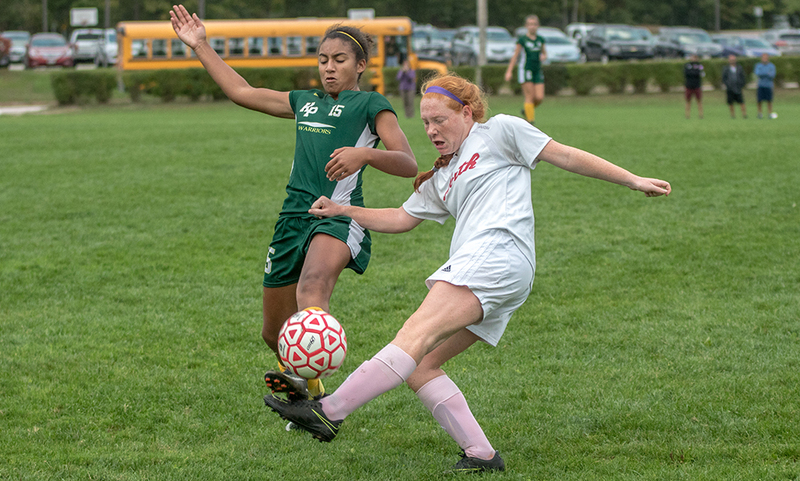 – Both King Philip and North Attleboro boast some of the top goal scorers in the area, all-league caliber defenders, playmaking midfielders, and goalies capable of making game-changing saves. It’s no wonder the sides played to a 1-1 draw on Wednesday afternoon. The Rocketeers were indeed on the front foot in the first half. After King Philip had a pair of possible chances inside the first two minutes, the majority of play belonged to the home side. KP’s Emma Corcoran delivered a long free kick into the area that was touched on by Avery Snead, but North goalie Emma Noreck was quick to cover before Chloe Layne could pounce on the loose ball. North nearly opened the scoring on a corner kick in the ninth minute, when Ashlyn Gaulin’s left-footed service was tipped on by KP keeper Emma Durant, falling to Kayla Pasquel but her volley effort went over the bar. But a minute later, the Rocketeers did break through on another corner attempt. Gaulin’s service was knocked down, bouncing out to Leah Jette. She quickly put the ball back into the mix in front of net and senior Haley Guertin buried from close range to make it 1-0. Snead had a pair of chances six minutes later. First, she was able to get in behind the defense but strong work from North’s Rachel LaBonte forced a tough angle shot that was saved by Noreck. A minute later, Snead was put in behind the defense but Noreck was quick off her line and won the race to the ball. In the 25th minute, Emma Gaulin won possession along the touchline and ripped a shot at the near post, but Durant knocked it down for the save. Emma Gaulin had another chance on a rebound bid eight minutes later on a service from sister Ashlyn but Durant sprawled to make another stop. Durant made one more big stop in the first half, denying Jette’s bid from outside the area. North Attleboro’s defense doubled both Layne and Snead often, with Labonte and Hawkins shadowing one of the two around. The Warriors put the pressure on in the second half, pushing the majority of play into their attacking third. Just eight minutes into the second half, KP nearly found the equalizer when Ally Stanton drove a shot from just outside the area that looked destined for the back of the net, but Noreck made a diving save to push it wide. KP had its second and third corners come in a 10-minute span during the second half but North’s defense did well to clear it away. In the first meeting between the two teams, in a non-league game, the Warriors scored twice on corner kicks to win 4-2. The visitors finally found the equalizer in the 64th minute. Corcoran delivered a free kick from just over midfield that found the head of Layne. She flicked the service on, and Snead latched onto it and looper her header over the keeper and into the net. North Attleboro had a final shot at finding a winner when Gaulin played a through ball for Jette, but Durant came out and cut down the angle, knocking down the shot at the near post to keep the game level. King Philip girls soccer (12-1-1 overall, 9-1-1 Hockomock) begins the final stretch of the season with five straight Kelley-Rex games, starting with a visit from Attleboro on Friday. North Attleboro (7-2-2 overall, 7-1-2 Hockomock) entertains Canton on Friday in a key division battle — the two sides are separated by just two points with five league games left.